Today, 80 percent of Internet users own a smartphone. It’s been predicted that, by this year, eight in ten email users will access their email accounts exclusively from their mobile devices. We’re reading and writing more emails on mobile than ever, so getting it right has never been more important. Getting communication right (in email or otherwise) is the driving force behind Grammarly’s recent launch of a mobile keyboard for iOS and Android. But, although Grammarly will help you write mistake-free messages, it’s combining that polish with style and substance that will inevitably make your written communication effective. We’ve all seen the ubiquitous “Sent from my iPhone” email signatures, or sigs along the lines of, “Please excuse the brevity. This was sent from my phone.” These signatures, in part, are meant to excuse the sender from typos, autocorrect slips, and all those other times our thumbs betray us when we communicate via mobile devices. But just because you wield your thumbs instead of ten phalanges carefully placed on the home row doesn’t mean everything you send from your phone has to look as though it was transcribed by a typing chimpanzee. There’s hope! 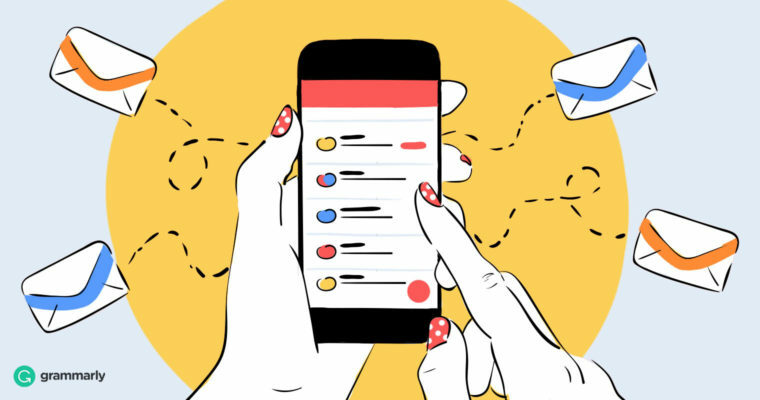 This article will guide you towards writing clear, concise emails from your mobile device with panache. 1 Put important information first. Nearly half of mobile readers spend three seconds or less reading an individual email. That is, of course, if you can get them to open your email at all. But let’s assume you send emails that people want to read. Your challenge is to keep those emails brief or risk losing your reader to a very short digital attention span. That means it’s essential to optimize. Before you put your thumbs to work tapping out your email opus, take a few minutes to figure out the key point you want to get across in your message. Ask yourself If I could have my recipient take just one thing away from this email, what would it be? Use the answer to that question to front-load your email so that the most critical information comes first. If you don’t, your recipient might miss the point of your email entirely, or breeze past it in her haste to move on to her next email to-do. Oy! That email comes in at around a hundred words, and most of them aren’t necessary. Let’s consider all the things this message conveys that it doesn’t have to. For starters, it’s not necessary to state that Jim suggested talking to Jane. Especially not up front. If Jim’s referral would be helpful in sealing the lunch appointment, go ahead and use it, but consider saving it for later in the email. It’s also not necessary to reiterate that a client is important. Any time you start a sentence with As you know, you’re probably telling the reader something they actually do already know. Driving home the point with an as you know statement can translate as passive-aggressive. It’s as if you’re saying, “You should know this, but I’ll reiterate just in case you’re not good at your job.” Make sure you don’t come across as talking down to your colleagues. While it’s nice to consider a lunch location that’s convenient for your colleague, it’s not necessary to point out how nice you’re being. That extraneous information adds words, not impact. Let’s front-load this email with important information and leave out any unnecessary details. Much better! The message body comes in at a sleek forty-nine words and the all-important ask is straight up front rather than buried in a bunch of unimportant details. We can almost taste those sammiches now! 2 Clean up your wordy writing. Can you imagine how long it would’ve taken Tolstoy to compose War and Peace on a smartphone? If you want to really feel like a slacker, consider that one novelist wrote a significant portion of his novel on his smartphone while commuting on the subway. (And he did it nearly a decade ago.) When you’re using two thumbs and staring at a small screen to craft your messages (let alone a novel), it pays to know how to keep your writing lean and mean. First, avoid common filler words and phrases. We already talked about As you know. Now, strike useless phrases like As a matter of fact, For the most part, each and every, and at this point in time from your lexicon. Your readers will appreciate your clear, concise language and you’ll convey your points much better without all the clutter. While you’re at it, dump most adverbs. These words, which often end in -ly, are unnecessary unless removing them drastically changes the meaning of your sentence. So, don’t bother thumb-typing words like basically, very, usually, extremely, probably, and absolutely. 3 Practice perfect email etiquette. Your signature may say that your email was sent from your phone, but that doesn’t mean you should bypass the rules of polite email discourse. When you send email to multiple recipients at the same time, respect everyone’s privacy by masking their email addresses with BCC. Similarly, don’t use Reply All and accidentally share an email with all members of an email chain when your reply was meant only to go to one person. And don’t automatically assume that email is private and confidential. Avoid saying things in an email that you wouldn’t say publicly. Otherwise, that email could come back to haunt you. Here’s a tip: Don’t email when you’re angry. If you must tap out a strongly worded letter, hold off on hitting the Send button until you’ve had a chance to let it simmer. If you can wait, leave that letter on the back burner and come back to it twenty-four hours later. Were you more hostile than you meant to be in the heat of the moment? Could you have been more diplomatic and gotten your point across just as well? Edit! Some years back, my friend and I tried having a Messenger conversation by using our phones’ voice-to-text feature, and then sending whatever our smartphone interpreted. The result was hilariously bad. But voice-to-text has come a long way since then. Most mobile keyboards have voice-to-text functionality. On the Grammarly keyboard, simply long-press the comma key to activate your phone’s voice capabilities and dictate your message. Once dictated, you can quickly edit or correct any misheard words. You want to make a good impression. Proofreading is one way to ensure you will. We often write hasty notes when we use mobile technology, figuring that others will forgive us because, well, writing on a mobile device has its challenges. But proofreading before you hit send isn’t that complicated. And, if you’re using the Grammarly mobile keyboard, you can simply press the Grammarly button once you’ve finished writing to check your text and make sure your grammar, spelling, and punctuation is pristine. No more excuses just because you sent it from your iPhone!